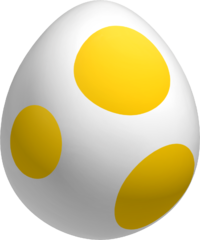 8 My egg! It hatched! You all know I have the personality of a Boo, to be more clear Shy Guy. If you want to be my friend, just add this userbox on your page. This user is used to Lost Mini Star09 (talk). A lot. 40px This user is friends with Smasher. This shy ghost causes you to lose two wedges of health if it touches you. A little strong perhaps? If those nasty mushrooms see you, they'll charge at you, causing you to lose one wedge of health. May be weak, but Micro-Goombas are weaker. Thwomps are such mean blocks! I mean waiting for you to come, then crush you. That makes you lose many wedges of health! Whomps are just like Thwomps, they get so many haters. They try to crush you, they deal damage similiar to Thwomp's. Fly Guys are the only Shy Guys to appear in this game, they dive down at you. But if you stomp on them, you'll go on a helicopter ride. I also have other favorites, but I don't feel like listing them right now. They are shy troublemakers (hence their english name) wearing robes and masks. They feature many Sub-Species, one of them feature a propeller on their heads, and one of them features a gasmask. However, it's unknown how Shy Guys look like without their masks. Maybe the masks are their faces considering their masks can change expressions. 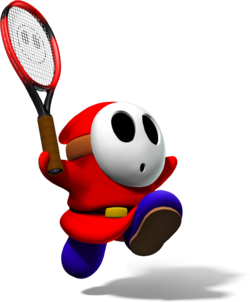 But the mask can still fall off, as shown on Mario Power Tennis and Super Mario Strikers. 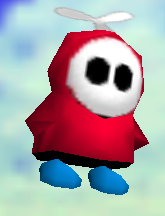 It is implied that Shy Guys might be Toadies, they both wear red robes and feature a propeller on their heads, similiar to a Fly Guy. In Luigi's Mansion, Boo Guys made a appearance, using the poltergust, Luigi can remove their masks. A Boo Guy's face features yellow glowing eyes. Their Japanese name is "Heiho", meaning "Hey-Ho", which means nothing really. Fakemons are Pokemons made by fans, fakemons contain their own base stats, signature moves, abilities, evolutions and origins. My fakemon is named Froshaby, it's a ice shard-like ghost that can't float. They have a peaceful nature, they don't seem to scare others at all. Froshaby are too shy to look many others in the face, it will hide behind it's arms and increase it's defense. Froshabies seem to have relationship with Wlizzards, they both have ice powers and can learn a few water moves, a Froshaby only reaches it's first stage, Froshade once it wears a Wlizzard. The first evolution of Froshaby is Froshade... Froshade shares the same attributes with Froshaby such as being shy, but instead of being a ice shard, Froshade is now a spherical ghost and can float, similiar to that of a Boo. Froshade also have the ability to change their eye color depending on their emotions. A Froshade will begin to get weaker if the Wlizzard on it's head is removed, this also happens with Froshaby's final evolution, Iceshadow. Froshade are pretty carefree and naive, they tend to be nice with strangers. However, since Froshade's arms are stronger than their first stage, they can learn moves such as Gyro Ball, Mega Punch and Ice Punch. When a Froshade gets angry, it becomes a ghastly creature with large sharp fangs and claws. The red eye color remains on the Froshade as it's mad. Another one of my fakemons is Wlizzard, it's a wizard hat that resembles a Magikoopa's hat. Wlizzards usually have a cute face, but once the Froshaby that's wearing it becomes a Froshade, it lacks mouth and have angry eyes, and star eyes when the Froshade evolves into a Iceshadow. The Wlizzard species doesn't seem to trust the Froshaby species, since a Wlizzard has angry eyes when the Froshaby wearing it evolves. Despite that, Froshaby and their evolutionary family are very friendly. Wlizzard is a Ice/Psychic type, but they can also learn variety of Water moves such as Aqua Jet, Brine and Rain Dance. IceShadow is the final evolution of Froshaby. IceShadow still remainds of what it was as a Froshade, but pretty larger and the Wlizzard they wear has a different expression. IceShadow doesn't have the ability to change it's eye color depending on it's emotion, but the Wlizzard can copy it's emotions. When a IceShadow is angry, it becomes just like it's pre-evolution Froshade. You know Mario Kart Wii, that installament of Mario Kart for the Nintendo Wii? That game included online playing... Awesome! But there's alot of danger in Wi-Fi. There are some players who use hacks to spam powerful items such as Bullet Bill, Star, Blue Shell, Red Shell and Lightning, those kind of people are known as "hackers". Q: What kind of device they use to hack Wi-Fi? A: Probably Geecko USB whatever it's called, some hackers use Geecko the same way to hack SSBB. Q: Are there friendly hackers? A: No, hackers were raised to be evil. Q: How does someone become a hacker? Q: What do hackers get from hacking? Q: Can skilled players get mistaken for hackers? A: If you get the same item multiple times in a row with luck, probably. Q: For what hackers hack for? A: Well, for victory and annoyance. What else? Q: Why is this Q&A being written? A: Just to share some info about hackers to other people. Q: Are there hackers in other Mario Kart games? A: Yes, but it's pretty obvious in emulators. Q: What about other games, do they have hackers too? A: Yes, emulation hackers is even worse. There are some Mario games that don't involve saving the princess and battling Bowser called spin-offs. They are very fun! My favorite of them all is Mario Kart! I also like Mario Super Sluggers and others! Spin-offs involve many sports such as baseball, volley, olympics, etc. Luigi is my favorite character. He makes a good character to play as! Paragoomba is cool, it can even play baseball without hands! Blooper is so cute! Good to play as too! Koopa Troopa and Paratroopa are pretty cool too, but I don't like Koopa Troopa that much. Boo was always my favorite enemy since the days of SMB3. It's shyness describes me perfectly. This is my pet Yoshi, I named him "Terry". I got him from a great guy called MarioMan51, he gave me a yellow egg and it hatched. 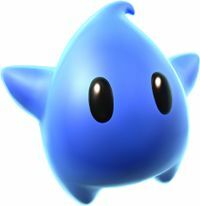 This is my blue Luma pet, I got her from MarioMan51's cool shop. She prefers eating white Star Bits, but she does eat the other Star Bits though. I named her "Luck", because she feels lucky for staying with me. Boo Mushroom: Got from MarioMan51's wonderful shop. This page was last edited on August 2, 2016, at 03:49.